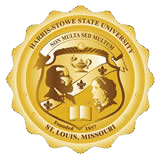 While Harris-Stowe State University is a public state institution, between the operating hours of 8 a.m. and 10 p.m., during regular class sessions, the university reserves the right to question anyone on or within the realm of campus. All visitors on campus must first visit the Office of Campus Public Safety in the Henry Givens Jr. Administration Building, Room 019 or at either of the front desks of Gillespie or Bosley Halls. Failure to do so will result in the individual being asked to produce a valid state ID or current student ID. If neither is produced, depending on the nature of the business being conducted on campus, he or she may be asked to leave Harris-Stowe State University. If one is visiting the campus to pass out leaflets or to post fliers of any sort, all materials MUST first be approved AND stamped by the Office of Communications located in HGA 307. Student organizations looking to post flyers must seek approval from the Office of Student Engagement, Gillespie Residence Hall & Student Center 134A. Flyers are not to be posted until approved and stamped. Student Organizations are to remove flyers 24 hours after the scheduled program/event.